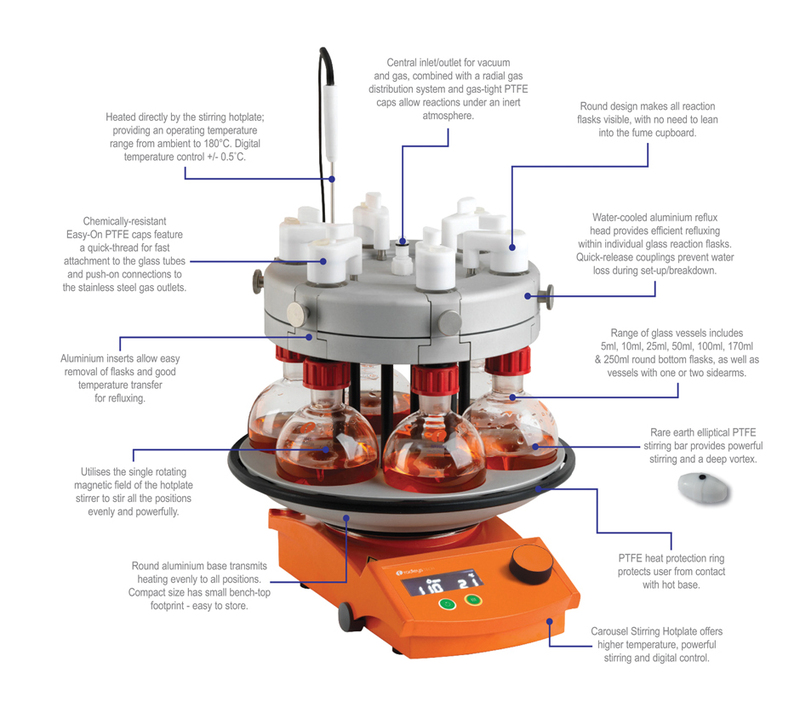 Carousel 6 Plus Reaction Station™ – Inspire Scientific Co., Ltd. 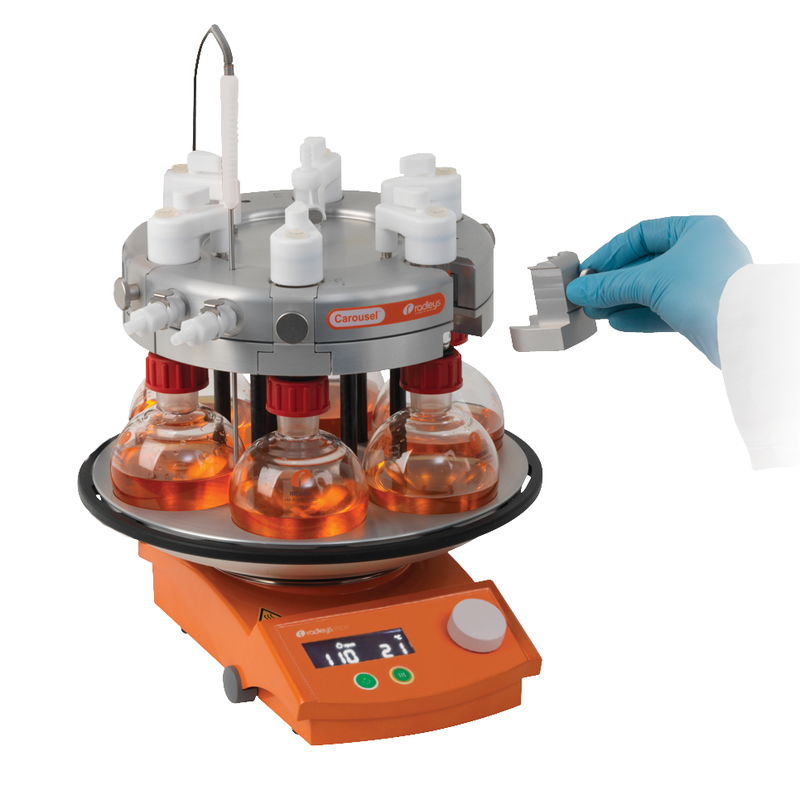 Locating onto the Carousel Stirring Hotplate, the Carousel 6 Plus will simultaneously heat up to 6 reactions from ambient to 180˚C with an accuracy of ±1˚C; Boils six flasks of water in less than 25 minutes.The temperature can be controlled using the hotplate’s integral digital control or for greater accuracy, via an optional Pt1000 temperature sensor. The Pt1000 temperature sensor allows users to control by block or solution temperature. Either insert the temperature sensor into the aluminium base or through the Suba-Seal in the cap, directly into the reaction solution. A PTFE heat protection ring helps protect user from accidental contact with hot aluminum base. The Carousel’s patented design ensures powerful and equal stirring in all 6 flasks. 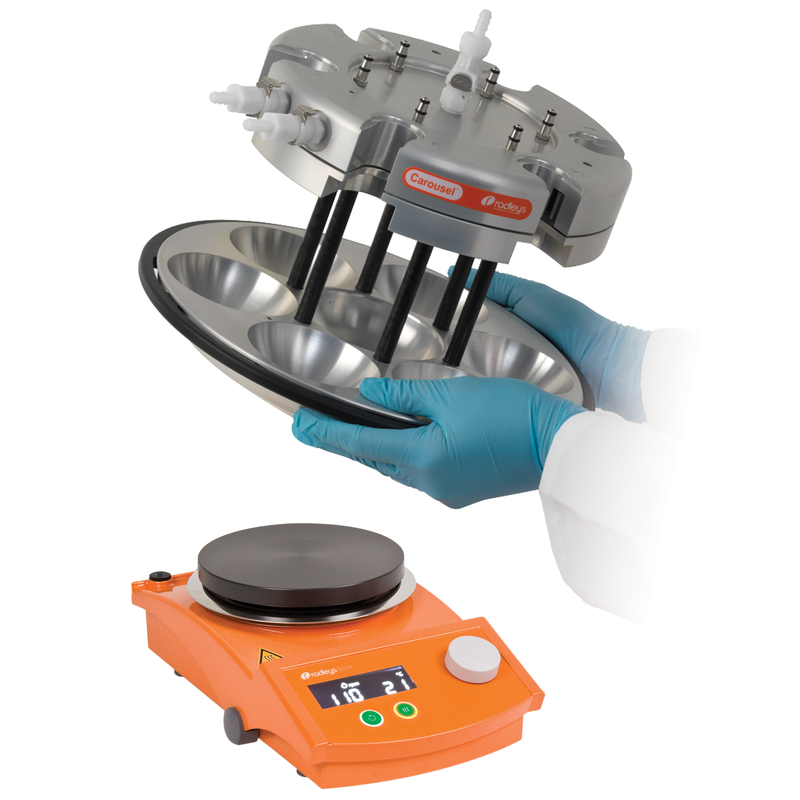 By positioning the flasks and magnetic stirrer bars equidistant from the stirring hotplate’s centrally located magnet, the Carousel ensures that all vessels are stirred at the same speed. The Carousel’s integral water-cooled reflux/inerting head provides efficient cooling to all tubes; minimising solvent evaporation and loss. Water circulates inside the reflux head creating a cooling zone within the upper part of each tube, where vapours cool and condense back into the reaction. Quick-release water couplings with integral shut-off valves aid the connection of the water supply and minimise leaks. 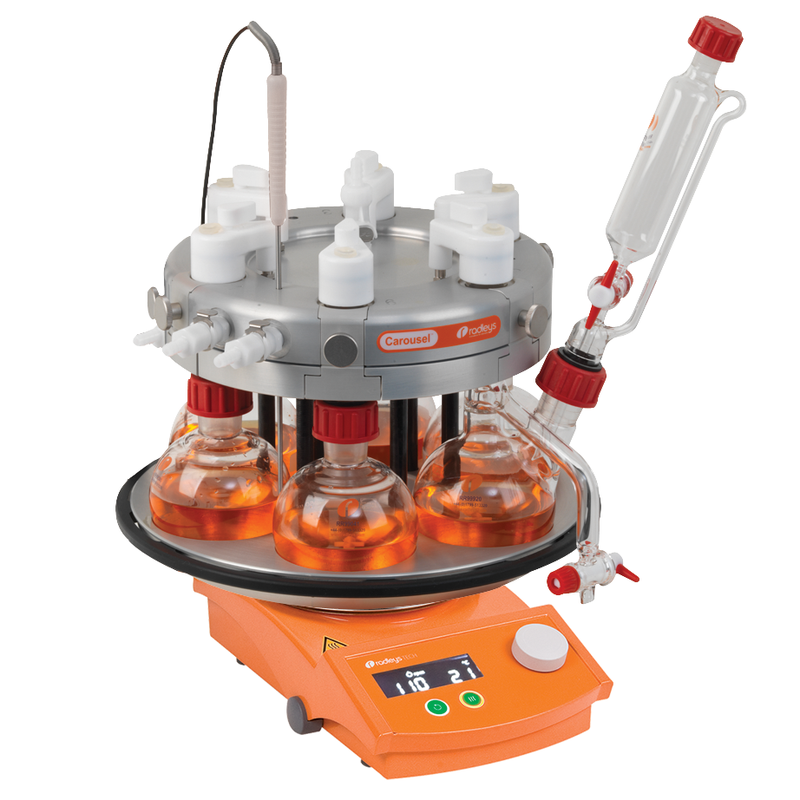 Removable aluminium inserts in reflux head allow easy removal of flasks, yet maintain good heat transfer for refluxing. Built in spring clip retains flasks once aluminium insert is removed. Acetal quick-release valved couplings on the side of reflux head allow disconnection of cooling water without loss of water. 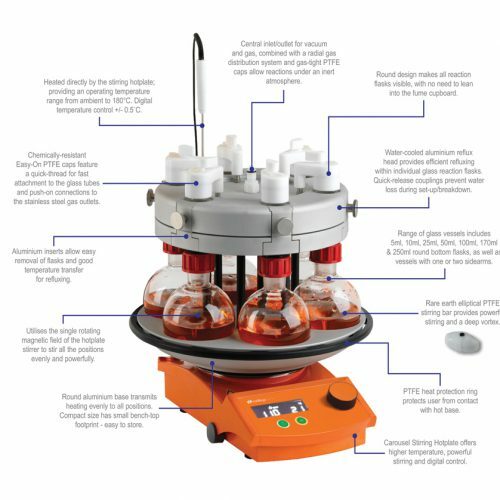 An integral radial gas distribution system in the Carousel 6 Plus reflux/inerting head combines with individual gas-tight Easy-On PTFE caps, which screw directly onto the reflux tube of each flask, to distribute inert gas to all 6 vessels. To purge the flasks simply connect the central gas inlet via flexible tubing to a two-way stopcock then, by alternating between vacuum and inert gas, the flasks are quickly purged of unwanted air. This easy to use inerting feature is ideal for reactions requiring an air or moisture-free environment. Acetal quick-release coupling on top of the reflux head facilitates supply of inert gas or vacuum. The PTFE caps are an essential component of the Carousel 6 Plus. 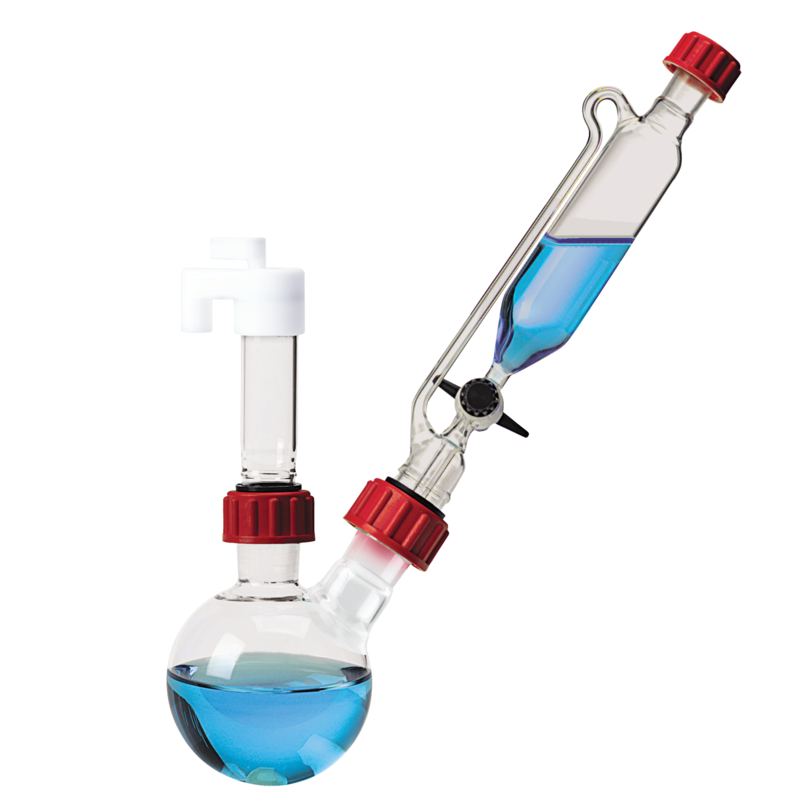 Manufactured from a chemically-resistant PTFE the caps are attached to the reflux tube/flask using a quick-thread and feature an Easy-On push connection to the radial gas system. The caps include an on/off valve for isolation and removal from the inert gas system. A replaceable silicone Suba-Seal septum allows the addition or removal of reagents or samples using a suitable syringe. 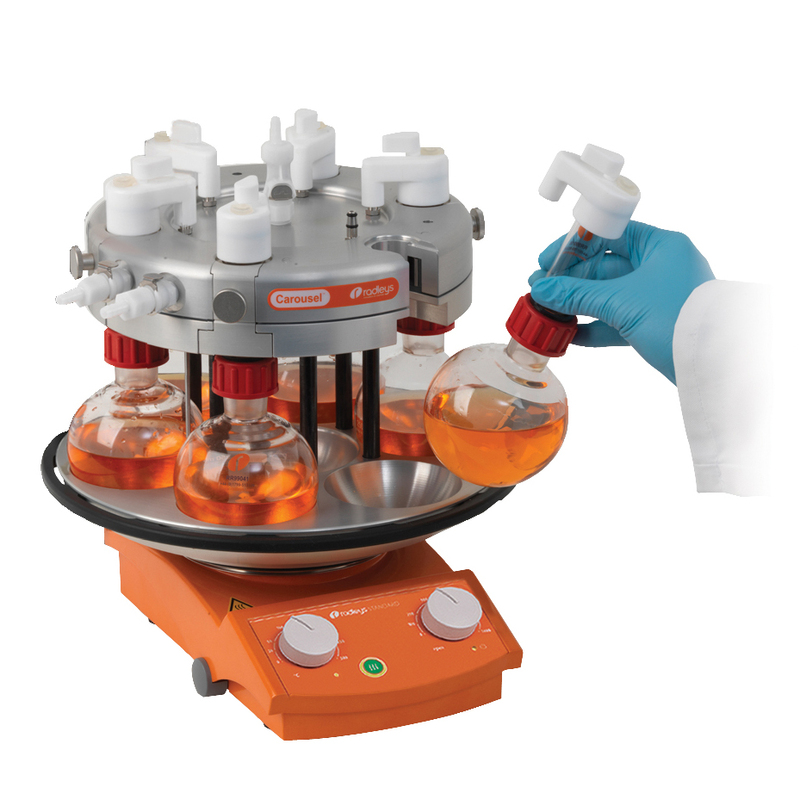 The Carousel 6 Plus accepts round bottom flasks including: 5ml, 10ml, 25ml, 50ml, 100ml, 170ml and 250ml sizes. 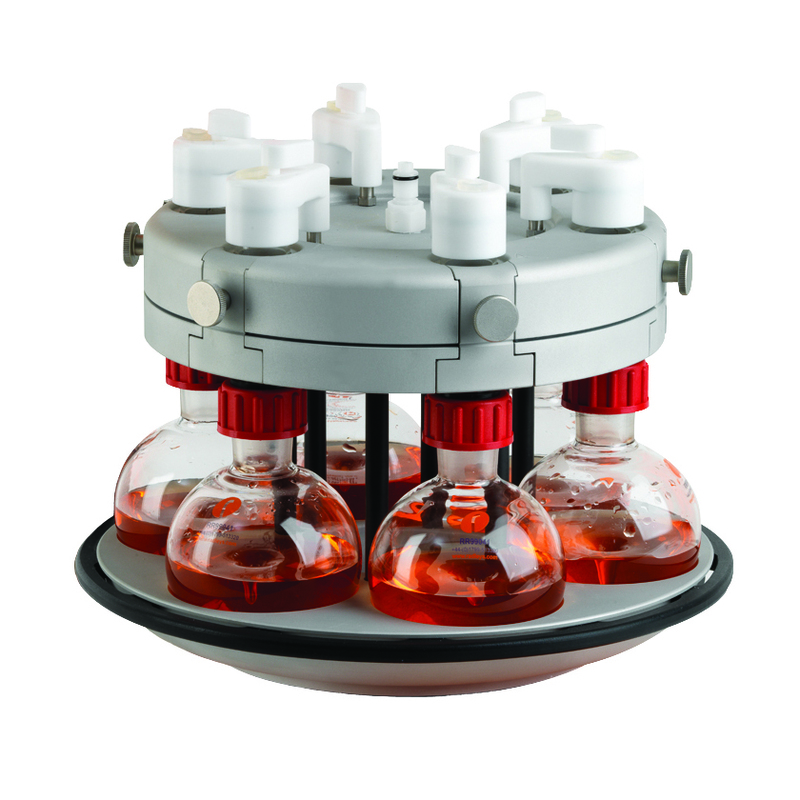 The range includes flasks with wide necks, baffles and also specialist Azeotropic flasks. Click here to see the full range. These aluminium reducing inserts fit into the 250ml wells of the Carousel 6 Plus to allow the use of smaller flasks. Inserts are available for 5ml, 10ml, 25ml, 50ml, 100ml and 170ml Flasks.